Pep Guardiola has said that his side are proving playing in the same style as Barcelona can work in England after they won a Premier League record 14th successive game. Manchester City went 11 points clear at the top of the table after their 2-1 win against Manchester United. "People said we couldn't play the way we did in Barcelona in England,"said Guardiola, who won 3 La Liga titles in four years at the Camp Nou. "But it is possible and we did it." Pep first season in England wasn't that impressive has City finished 15 points behind champions Chelsea. The Spaniard tried then to implement the same passion-based philosophy but he couldn't. 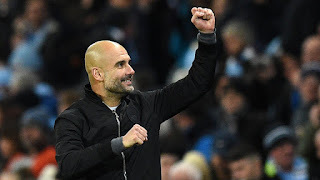 However after a summer of spending big and recruiting players who fit Guardiola's style and a year of working under his methods, City are now well placed to win their first league title since 2013-2014 season. "The personality to play here is what i want, We can play this way in England. I knew that last season". "Always I believed we could do it. Everyone can play how they want, that's why football is so beautiful. "I'm happy to go to Stamford Bridge and Old Trafford and to beat them in this way." Pep played down suggestions that victory over United meant the title race was all but over. "This win means a lot in the way we played for our confidence,"he said. "But in three days we go to Swansea in the winter time. "We are going to face a lot of difficulties. In December it's impossible to be champions but it's good for us."